Son of a prominent newspaper editor. Ordained in Brescia, Italy on 29 May 1920, he continued his studies in Rome, Italy, and became part of the Vatican secretariat of state in 1922. One of two pro-secretaries to Pope Pius XII. Archbishop of Milan from 1954 to 1963 where he worked on social problems and to improve relations between workers and employers. Created cardinal-priest of Santi Silvestro e Martino ai Monti on 15 December 1958. Elected 262nd Pope in 1963. As Pope, Paul continued the reforms of John XXIII. He re-convened the Second Vatican Council, and supervised implementations of many of its reforms, such as the vernacularization and reform of the liturgy. He instituted an international synod of bishops; bishops were instructed to set up councils of priests in their own dioceses. Powers of dispensation devolved from the Roman Curia onto the bishops, rules on fasting and abstinence were relaxed, and some restrictions on inter-marriage were lifted. A commission to revise canon law revision was established. In 1964, Paul made a pilgrimage to the Holy Lands, becoming the first pope in over 150 years to leave Italy. That was followed by trips to India in 1964, the United States in 1965, where he addressed the United Nations, Africa in 1969, and Southeast Asia in 1970. Relations between the Vatican and the Communists improved, and Communist leaders visited the Vatican for the first time. Paul met with leaders of other churches, and in 1969 addressed the World Council of Churches, and limited doctrinal agreements were reached with the Anglicans and Lutherans. Paul issued frequent reassertions of papal primacy in the face of growing dissent within the Roman Catholic Church itself. He enlarged the college of cardinals, and added cardinals from third world countries. In the 1968 encyclical Humanae Vitae, Paul reaffirmed the church’s ban on contraception, a disappointment to many liberals. It led to protests, and many national hierarchies openly modified the statement. Liberals raised questions about priestly celibacy, divorce, and the role of women in the church, but Paul held to traditional Church positions. Daughter of Count Anthony Ledochowska, a Polish noble, and an Austrian mother. One of five children in a pious family; sister of Saint Theresa Ledochowska. Due to financial failure, the family moved to Saint Poelten, Austria in 1873. Her father died of smallpox in February 1885, and Julia's uncle Cardinal Lebo assumed responsibility for them. Julia felt a call to religious life, and became an Ursuline nun, taking the name Ursula. Founded the Ursulines of the Sacred Heart (Ursuline Sisters of the Agonizing Heart of Jesus, Gray Ursulines) in 1906 with the motherhouse in Pniewy, Poland. Missionary to Russia in 1907 by order of Pope Pius X. Expelled during the Communist Revolution, she continued her work throughout Scandanavia. Translated and published a catechism in Finnish. At the request of Pope Benedict XV, she moved to Rome. From there she administered her Order, and inspired others. A noted orator, she frequently spoke before royalty and national leaders. Called for, and defended the right of Polish independence. The Gray Ursulines continue their work today in Poland, Italy, France, Canada, Brazil, Argentina, Finland, Germany, Tanzania, Belarus, and Ukraine. Born to the Gallic nobility. Brother of Saint Maxentius of Poitiers. Educated and ordained by Saint Agritius, whom he succeeded as bishop of Trier in 332 or 335. Trier was the government seat of the Western Empire, and his office put Maximinus close contact with Emperors Constantine II and Constans. Friend of Saint Athanasius of Alexandria, whom he harboured as an honoured guest during his exile from 336 to 338. Received the banished patriarch Paul of Constantinople in 341, and effected his return to Constantinople. Fought Arianism. When four Arian bishops came to Trier in 342 to sway Emperor Constans, Maximinus refused to receive them, and convinced the emperor to reject their proposals. With Pope Julius I and Bishop Hosius of Cordova, he persuaded Emperor Constans to convene the Synod of Sardica in 343, and probably took part in it. Arians considered him one of their chief opponents, and they condemned him by name at their synod of Philippopolis in 343. In 345 he took part in the Synod of Milan, Italy. Presided over a synod at Cologne, Germany in 346 where Bishop Euphratas of Cologne was deposed due to his leanings toward Arianism. Sent Saint Castor and Saint Lubentius as missionaries to the valleys of the Mosel and the Lahn. His cult began right after his death. Educated at Queen's College, Oxford, 1564 - 1565. Studied at Douai and Rheims, France. Ordained on 18 April 1579 at an age somewhat older than his confreres. Returned to England on 23 May 1579 as a home missioner around York. Confessor to Saint Margaret Clitherow. Arrested on Annunciation Eve in 1583 for the crime of priesthood; the authorities became suspicious when he visited a Catholic prisoner. Lodged in Ousebridge Kidcote prison, York, for two months. He wore a cassock to trial, was convicted on 27 May 1583 of hearing confessions and bringing the lapsed back to the Church, and was sentenced on 28 May 1583 to death. He used his time in jail to minister to other prisoners, working especially with others sentenced to death. Martyred in secret for fear his covert parishioners would cause a civil disturbance. Six of his letters have survived. Mystic and visionary from her childhood. Augustinian tertiary by age 10. Pilgrim to the Holy Lands at age 14, travelling to see her father who was fighting in the Crusades. On the way home she was captured and imprisoned by Islamic pirates in the Mediterranean, but was rescued by fellow Pisan Christians. Pilgrim to Rome, Italy. Pilgrim to Santiago de Compostela, Spain nine times, leading groups of pilgrims each time, which led to several of her areas of patronage. Father of Conon the Younger. On the death of his wife, the Elder urged his son to religious life, and lived as a hermit himself. He and his son were charged with the treason of being Christian; both freely admitted it. Tortured and martyred. Raised in a wealthy pagan family, in his youth Cyril was baptized in secret. When his family learned of his conversion, his father banished him from the family estate. Cyril was imprisoned for his faith, and ordered by local officials to renounce Christianity and sacrifice to idols; he refused. Martyr. Son of Saint Conon the Elder. 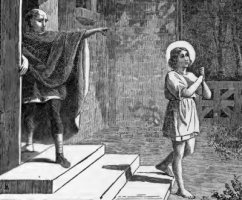 A pious youth, he was a lector at age 12. Deacon. He and his father were charged with the treason of being Christian; he freely admitted it. Tortured and martyred. Lay woman who married young and had several children. She eventually convinced her husband to become a Camaldolese monk at San Salvio. She lived nearby as a recluse, under the obedience of the abbey, but without taking orders. Obtained a degree in theology. Mercedarian. While suffering regular beatings and abuse for being a Christian, he not only ransomed many Christian slaves in Africa, he converted others to the faith. Martyr. Imperial Roman soldier during a period of persecution. Suddenly moved to proclaim his faith, he threw off his military belt and announced himself a Christian. He was promptly executed. Martyr. Brother of Saint Votus. Hermit in the Pyranees mountains under a huge rock on which the Benedictine abbey of San Juan de Peña, a cradle of Christianity in Navarre and Aragon, was later built. Brother of Saint Felix. Hermit in the Pyranees mountains under a huge rock on which the Benedictine abbey of San Juan de Peña, a cradle of Christianity in Navarre and Aragon, was later built. Hermit in the diocese of Jaca, Aragonese Pyrenees (in modern Spain). His cell was under a huge rock on which the Benedictine abbey of San Juan de Peña, a cradle of Christianity in Navarre and Aragon, was later built. Bishop honoured in Galloway, Scotland, who was known for his personal piety. Involved in the dispute over using the Roman or Celtic computation for Easter. Saint Bede the Venerable wrote about him, and his name is part of the Dunkeld Litany. Brother of Saint Grimwald and Saint Fulk. Died while on pilgramage. Priest. Papal legate to the Byzantine court of Theodosius II for Pope Saint Leo the Great. Attended the Council of Chalcedon. Archbishop of Milan, Italy in 472. Benedictine monk at Brou. Bishop of Mâcon, France for 40 years, but in his old age he resigned and retired to his old monastery to live as a hermit. Martyred in the persecutions of Diocletian; she died with 12 other Christian women, but none of their names have come down to us. Sixth-century bishop of Verona, Italy. A group of eleven Dominicans, Franciscans, Benedictines, clergy and lay brothers who worked with the Inquisition in southern France to oppose the Albigensian heresy. Basing their operations in a farmhouse outside Avignonet, France, he and his brother missioners worked against heresy. Murdered by Albigensian heretics while singing the Te Deum on the eve of Ascension. The church in which they died was placed under interdict as punishment to the locals for the offense. Shortly after the interdict was finally lifted, a large statue of the Blessed Virgin Mary was found on the door step of church. Neither the sculptor nor the patron was ever discovered, nor who delivered it or how. The people took it as a sign that they were forgiven, but that they should never forget, and should renew their devotion to Our Lady. 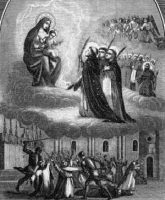 They referred to the image as "Our Lady of Miracles". Until recently there was a ceremony in the church on the night of the 28th to 29th of May, the anniversary of the martyrdom. Called "The Ceremony of the Vow", parishioners would gather in the church, kneel with lit candles, and process across the church on their knees, all the while praying for the souls of the heretics who had murdered the martyrs. 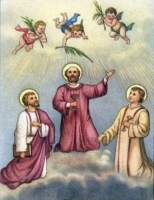 Three missionaries to the Tyrol region of Austria, sent by Saint Ambrose of Milan and welcomed by Saint Vigilius of Trent. All were martyred - Alexander, Martyrius and Sisinius.